Called by opponents the “Denying Americans the Right to Know” (DARK) act, under this law companies may choose any of three methods to inform consumers that their product contains GMOs: a text label, symbol, or QR code readable by smartphone. Small companies will be allowed to include a phone number or web address that will lead consumers to the information. Which option will companies selling GMO-derived products probably choose? Most likely the option that is most difficult for consumers to access, and provides the least amount of information. One third of Americans don’t own smart phones, especially among the elderly, and low-income families, disproportionately of color. So when corporations choose to hide information on GM foods behind a QR code, up to a third of the population won’t have access. There are no current fines included in the DARK act for not adding a label, image, or QR code, making most of the law unenforceable. Companies will even have two full years to enact the changes, and in the meantime consumers are still left without the information on GMOs in their food. The DARK act essentially overrules and undermines all individual state GMO labeling laws. It supercedes a Vermont GMO labeling law that went into effect July 1, which has tighter wording and requires GMO products to be clearly labeled. It overturns Connecticut’s GMO labeling law, as well as laws in Virginia and Vermont on GMO seed labeling. It even supercedes Alaska’s law calling for the labeling of GE fish or fish products, which was passed to protect Alaska’s vital fisheries from the recently approved introduction of GE salmon. Despite the DARK setback, the trend towards labeling has been underway for some time. 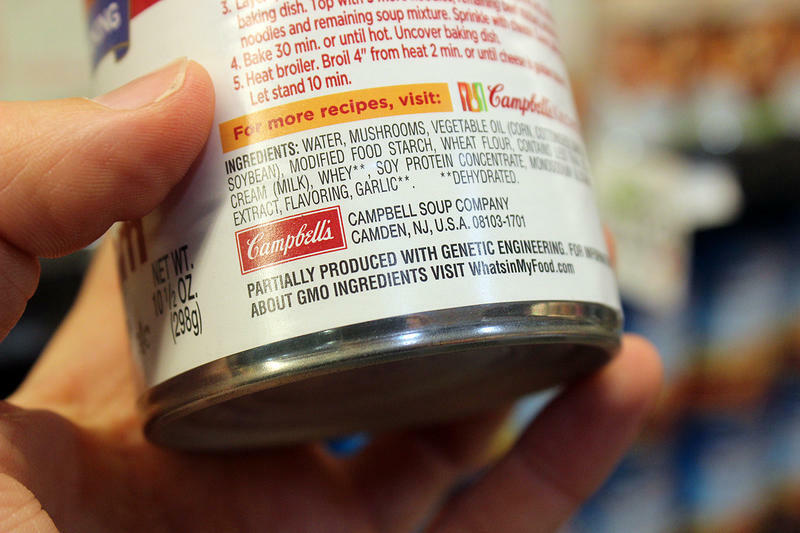 Multinational Danone, voluntarily labels it’s GMO-containing foods, as do Dr. Bronner’s soap products; pledges to label from Campbell’s and Mars underline the fact that consumer desire for labelling has been recognized by the industry. Consumers and physicians are concerned by possible health effects of eating GMO foods, not necessarily due to lack of research about the products’ engineering, but also because 90% of GMO crops are engineered to withstand high pesticide use, including Glyphosate, which has been classified by the World Health Organization as a carcinogen. Residues of this, or other pesticides and herbicides are a major concern not only for consumers, but also for the laborers growing GE crops, and the environment. The leadership of the Organic Trade Association(OTA) endorsed the bill without consulting a large portion of it’s members, inciting major criticism from important members of the OTA. The OTA describe their decision as a “compromise”, to protect their organic food standards in Congress, but it’s seen as a betrayal by many. Ronnie Cummins, the Director of the Organic Consumers Association(OCA), called out some of the big name organic companies as traitors to the GMO labeling movement, saying that they cut backroom deals to save their own products from being labeled at the expense of consumers. Ben Bronner, of organic soap company Dr. Bronner’s, and a major donor to several state GMO labeling initiatives, threatened to leave the OTA if he didn’t see a change in the current policy. In a piece he wrote for the Huffington Post called, The Organic Trade Association’s Betrayal of the Movement for Mandatory GMO Labeling, Bronner lays the bill’s passage entirely at the feet of the OTA leadership, pointing out that the OTA’s endorsement was critical to the bill being passed. The White House framed the DARK act as a way to enact national standards for GE labeling, instead of the patchwork of differing states’ standards which has formed in recent years. Activists such as Wenonah Hauter, executive director of Food and Water Watch, and an ally of AGRA Watch, called out the law as an attack on states’ rights. “This is a slap in the face for all of the activists that have worked hard to pass state-level measures because they believe strongly that labels should be transparent,” Hauter said in a recent statement. Hauter is correct in the view of AGRA Watch: People have the right to know when they are purchasing, and consuming foods containing genetically modified ingredients. While on the surface this new bill may seem to address the concerns of the nine out of ten Americans who support the labeling of genetically modified foods, there is much to be suspicious of. The DARK act nullifies hard won victories, doing more harm than good. The legislation won’t go unchallenged. Within a day of the President signing the bill, FoodDemocracyNow! announced it’s intention to file a lawsuit against the law, based on grounds that the law infringes on consumer’s 14th Amendment right of the constitution which guarantees “equal protection for all”. The Center for Food Safety(CFS), a partner of AGRA Watch, and a veteran of various legal battles surrounding GE organisms, is also launching a lawsuit against the DARK act– CFS put out a call for donations to aid in the legal fight. The OCA even launched an app that smartphone-owning consumers can use to scan product labels, and learn whether that product’s parent company lobbied for the DARK act, gaining the knowledge to make informed consumer decisions. Meanwhile, the Center for Food Safety will keep us abreast of any developments in the continued GMO labeling fight. Posted in GE, News and tagged AGRA Watch.